Dreamcatcher performs for Filipino fans at the SM Sky Dome in Quezon City Sunday night. 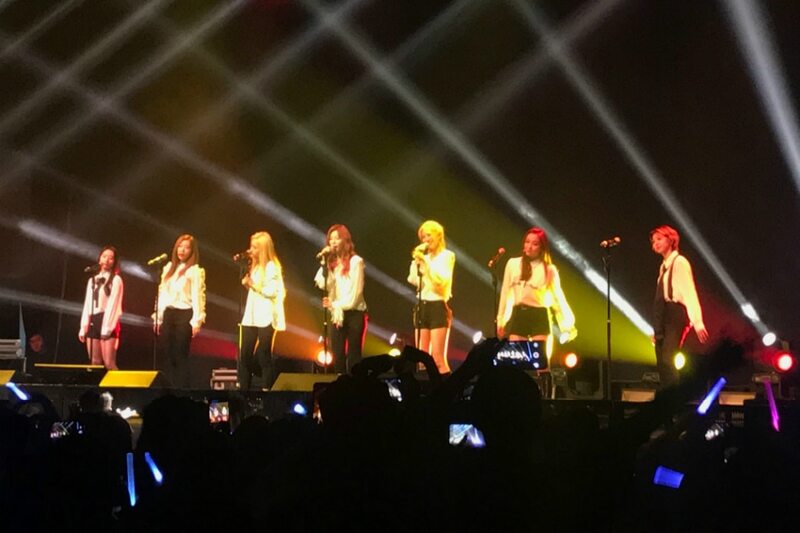 MANILA – Korean girl group Dreamcatcher made its Philippine concert scene debut Sunday night in a fan-initiated show at the SM Sky Dome in Quezon City, bringing their signature sound that fuses pop and metal. While genre-blending is nothing new in K-pop, Dreamcatcher stands out from the rest with their blend of K-pop and metal elements – elegant if not powerful dance routines set to songs laced with aggressive guitar riffs, pounding drum beats, and interjecting raps verses. It was refreshing to see the members playfully engage with fans, even giving in to requests to do “aegyo” or cute acts like baby talking and childish gestures. This showed a side of Dreamcatcher far different from the fierce attitudes they put on in their performances. The members also performed covers to prove they could pull off other genres. SuA and Yoohyeon sang “Attention” by Charlie Puth, followed by a Justin Bieber medley by Siyeon, Handong and Gahyeon, and a “cute” version of Flo Rida’s “I Don’t Like It, I Love It” by JiU and Dami. The septet capped off the night with their anniversary song “Full Moon,” followed by “And There’s No One Left” and “Wake Up” for their encore. The concert, part of the group’s “Invitation From Nightmare City” Asia tour, was made possible through MyMusicTaste, a crowd-sourcing platform for music and live events. Dreamcatcher debuted in 2015 as a quintet, MINX, until they re-debuted in 2017 with a new name and 2 new members.